Petro-Canada Oil has awarded KCA DEUTAG two multi-million dollar land drilling contracts. These two contracts are for Petro-Canada's drilling campaign in the Sirte Basin which comprises approximately fifty onshore vertical exploration wells. 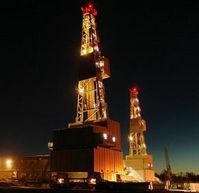 KCA DEUTAG's 1,500hp rig T-19 has been awarded a one-year contract, with a two-year extension option, and is scheduled to commence in 2Q, 2010. Rig T-72, a 2,000hp rig, is going to start operations for Petro-Canada in 4Q, 2010 following completion of a comprehensive refurbishment. In addition, Rig 32, KCA DEUTAG's 700hp workover rig, has been awarded a contract by JSC Tatneft Libyan Branch, which commenced in December 2009. The contract, which includes an option for an additional year, is for the completion of 2 wells in the Ghadames Basin within the concessions of the Russian Oil Company, Tatneft. Furthermore, the Libyan Sirte Oil Company has awarded a one year drilling contract to KCA DEUTAG'S Rig 206. The contract was signed on 19th January 2010 at Sirte Oil Company's Headquarters in Marsa El Brega, Libya. Currently the 1,200 HP rig is in its final preparation phase and will commence work beginning of March 2010.